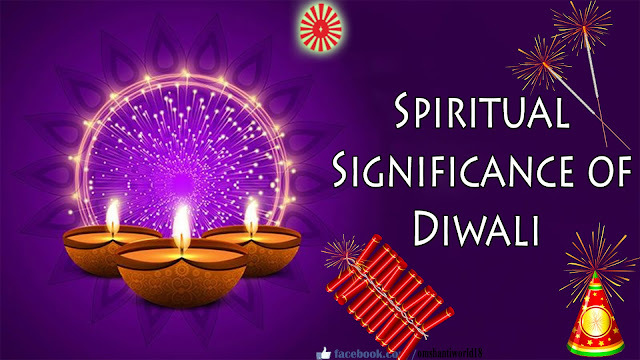 This post provides information about the Spiritual Significance of Diwali, the festival of lights. No other festival unites Indians around the world, as does Deepavali. A single diya holds infinite beauty and hope. While we celebrate these auspicious days with the same grandeur seen in the past, the pure beliefs held by our ancestors were more enlightening. Diwali is the commemoration of the light of wisdom in our lives. The word Diwali is made of two words i.e, deep (lamp or diyas) & avali (row), which means a line or a row of lamps. During the festival of Diwali lamps are lit in every home, office, etc. that is why this festival is also known as the ‘Festival of Lights’. Diwali is also called as Deepavali. The most significant spiritual meaning is "the awareness of the inner light" which seems to be lost somewhere today. In the history, Diwali can be traced back to ancient India. It most likely began as an important harvest festival. However, there are various legends pointing to the origin of Diwali. Some people believe that celebration of the marriage of Lakshmi, the goddess of wealth, with Lord Vishnu. Others use it as a celebration of her birthday, as Lakshmi is said to have been born on the new-moon day of Kartika masam. Diwali also commemorates the return of Lord Rama (along with Ma Sita and Lakshman) from his 14-year-long exile and vanquishing the demon-king Ravana. In joyous celebration of the return of their king, the people of Ayodhya, the capital of Rama, illuminated the kingdom with earthen diya's (oil lamps) and set off firecrackers. Diwali is a celebration of victory over evil and the coming of a New Year. But if we probe further, what is this darkness we want to remove? In reality, evil or darkness does not have an astitva or identity of their own – they exist due to a lack of goodness or light. Knowledge, power and all that is pure, are very real characteristics since they are part of us, perhaps dormant yet existing. The Festival of Lights, incidentally seen in every culture, is the fight against evil forces and creation of peace and happiness. 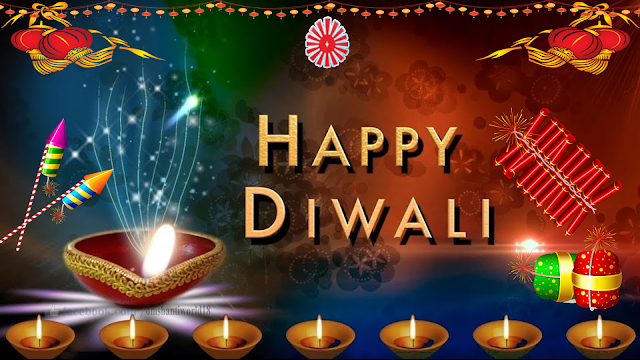 Diwali conjures up a number of things in the mind’s eye – sweets, new clothes, account books, Goddess Lakshmi, fireworks etc. We begin with Dhanamyodashi, where families worship Dhanvantari, a special ayurvedic herb said to cure a person of all illnesses. As science too proves, about 98% of all diseases are psychosomatic, meaning the problem lies in the mind. With time and circumstances, human beings have lost a great degree of their inner power, thus making them vulnerable to attacks from the vices (lust, anger, greed, attachment, ego). The weak mind has affected the body too and when we take the medicine of spiritual knowledge, prescribed by the Ultimate Doctor God, we can cure both mind and body. Our second day is celebrated as Narkchaturdashi. Spiritual Knowledge about Self-realization, God-realization etc. can only be taught by the Supreme. Diwali, the tradition of lighting diya's, actually describes how the Supreme Light comes to re-ignite our awareness of being points of energy or souls. This knowledge is used to overcome the foreign elements of vices. In memorial of these efforts, we have the story of Narkasur or destroying of evil. The third day is spent in invoking Goddess Lakshmi. Today, we have unfortunately lowered the status of Lakshmi Devi to that of a banker. In reality, her name stems from the word, ‘Laksh’ meaning ‘ the goal’, implying that she stands for the ultimate goal of perfection that human beings can reach. The ‘wealth’ that she has to offer is of knowledge and virtues; a divine character alone can attain prosperity (material and otherwise) and peace. Homes are cleaned thoroughly in her honor, but we forget that a clean mind and intellect are the easiest ways to attract her. Moving to the fourth day of Balipratipada, we see success at every step or padh/kadam when we maintain connection with the Supreme Soul. In spirituality, this is symbolic for yoga or union. When I visualize myself to be a point of light, and then direct my intellect and thoughts to the Supreme Parent, I experience God’s Shakti and love. This power helps me fight weaknesses and inculcate virtues. The beautiful process of gaining knowledge, overcoming vices, cleaning the intellect and remembering the Supreme, leads us to appreciate the fifth day, Bhaiyadooj or Bhaibeej. The knowledge of the ‘soul’ frees us from stereotypes and prejudices based on religion, caste, color, gender and age. We then see every individual as being a child of God and so part of my spiritual family - the ultimate truth. As per Godly Knowledge, the real Diwali will be the Golden Age or Satyuga. Everything will be pure in Satyuga. Here everybody will be abundant with all virtues, vice-less and non-violent.